Ruption18 asked the Answer Line forum what regular chores will keep his PC healthy. Back in December, I recommended ways to remind yourself to do regular PC maintenance tasks. But I neglected to discuss the actual tasks. Daily: Backup your data. You don't want to lose yesterday's work anymore than you want to lose last week's, so your documents, pictures, and application data should be backed up daily. For details, see 7 Backup Strategies for Your Data, Multimedia, and System Files, and consider one of the first three strategies. Weekly: Scan for malware. Your real-time antivirus program isn't perfect; something evil could slip by it. So to be on the safe side, get a second opinion every week by scanning with another security program. For that second opinion, you need something reliable, you want something free, and you don't need anything with real-time protection. 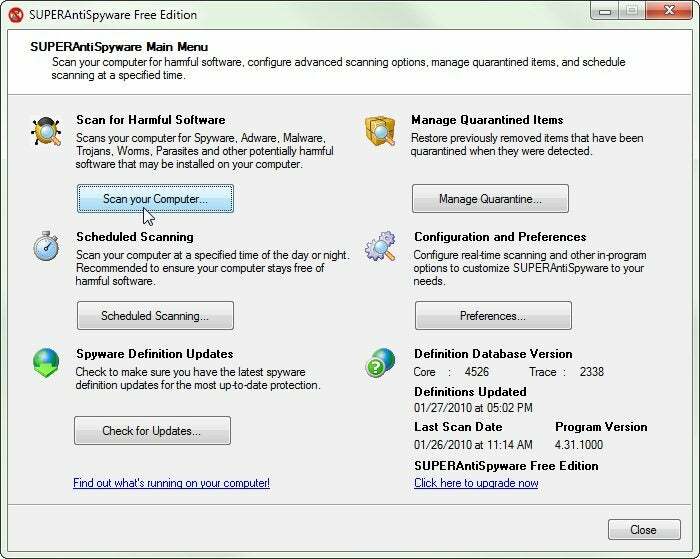 So I recommend either SUPERAntiSpyware or Malwarebytes' Anti-Malware. I use both, running one the first week and the other the second. Monthly: Defrag your hard drive. Over time, your files become fragmented--with any single file split over multiple physical parts of the drive. Fragmentation can slow your PC and render lost files less retrievable. Windows comes with a perfectly fine defragger. In Windows Explorer, right-click the C: drive and select Properties. Click the Tools tab, then the Defragment Now button. XP users will get a button to start the defrag. Vista and Windows 7 give you that plus an option to configure scheduled defragging. 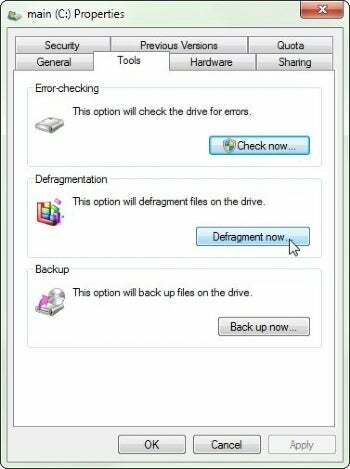 For more on Vista defragging, that also applies to Win7, see Vista Defrag Problems. Monthly: Scan your hard drive for errors.You're not looking for viruses or worms here, but physical and logical problems with the disk that could render parts of it unreadable. It's handy to do this chore at the same time you defrag, because both chores start on the C: drive Properties' Tools tab. To Scan the drive, click Check Now. Check both options, then click Start. An error message will tell you that Windows can't check the disk while it's in use. Click Schedule disk check (Vista or Win7) or Yes (XP). Then, the next time you plan to leave your computer for a few hours (for instance, to sleep), reboot. Windows will take a considerable amount of time (ballpark guestimate: one hour for each 100GB of drive space) before it's ready for regular use. an image backup of your entire drive can be a life-saver should your hard drive crash or Windows become hopelessly corrupt. A good image backup means never having to reinstall Windows from scratch. For more information, see Strategy 5 in 7 Backup Strategies for Your Data, Multimedia, and System Files.